Early emotional development, emotional regulation, and the links between emotion and social or cognitive functioning in atypically developing children have not received much attention. This lack is due in part to the priorities given to the educational and therapeutic needs of these children. Yet an understanding of the basic emotional processes in children with atypical development can only serve to promote more effective strategies for teaching and intervening in the lives of these children and their families and may contribute to our understanding of basic emotional processes as well. When referring to "emotions," the editors mean some complex set of processes or abilities, whether or not the topic is normal or atypical development. Specifically, they use the term "emotion" to refer to at least three things -- emotional expressions, emotional states, and emotional experiences. 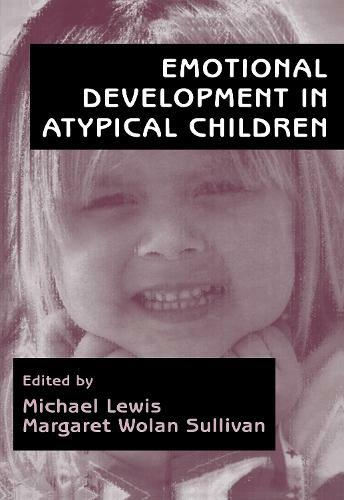 The focus of this volume, these three aspects of emotional life are affected by socialization practices, maturational change, and individual biological differences including, in this case, differences in children as a function of disability. Contributors examine the development of emotions in children with organic or psychological disorders as well as those in compromised social contexts making this volume of prime importance to developmental, clinical, and social psychologists, educators, and child mental health experts.